Walter & Cynthia Dunn had 1 male 5-9 years old in their household and this may have been Lucius as he was 8 years old and a "lad of tender years" when his mother died. John Quincy Dunn, first son of Walter & Cynthia, would have been 18 years old in 1840. Sometime after the census and a little older, Lucius was likely bound out and wound up in neighboring Jones County in the 1850 census. On motion it is ordered by the court that Lucas Potts have leave to peddle in Wayne County for one year. Could this have been Lucius living near his brother Newman? 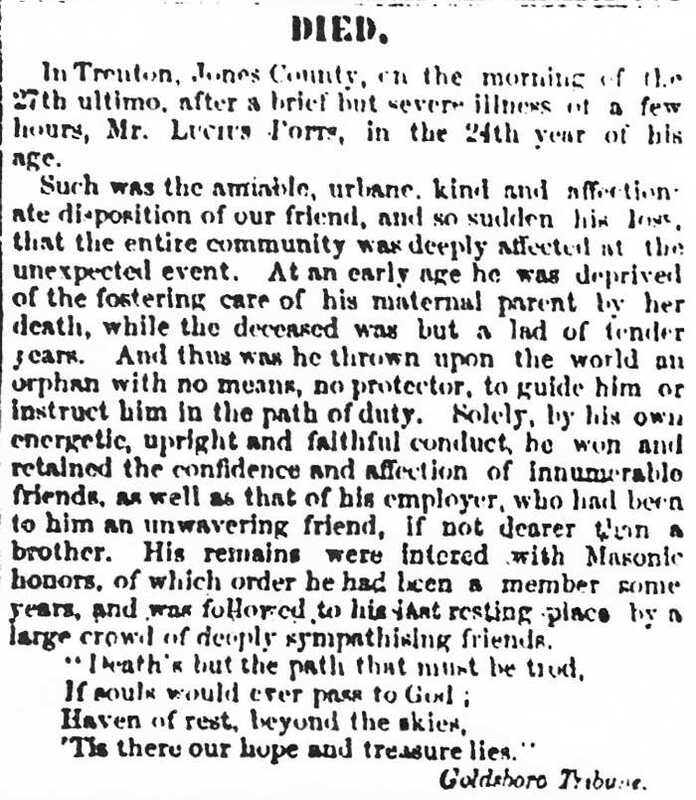 In Trenton, Jones County, on the morning of the 27th ultimo, after a brief but severe illness of a few hours, Mr. Lucius Potts, in the 24th year of his age. Such was the amiable, urbane, kind and affectionate disposition of our friend, and so sudden his loss, that the entire community was deeply affected at the unexpected event. At an early age he was deprived of the fostering care of his maternal parent by her death, while the deceased was but a lad of tender years. And thus was he thrown upon the world an orphan with no means, no protector, to guide him or instruct him in the path of duty. Solely, by his own energetic, upright and faithful conduct, he won and retained the confidence and affection of innumerable friends, as well as that of his employer, who had been to him an unwavering friend, if not dearer that a brother. His remains were intered with Masonic honors, of which order he had been a member some years, and was followed to his last resting place by a large crowd of deeply sympathising friends. 'Tis there our hope and treasure lies." On 22 Sep 1865, Hannah Potts Laroque wrote her brother Newman Potts in Wayne County about her husband dying and wrote about their brother Lucius' death in 1856, "I have lost one our dear brothern one whom I loved better than anything on earth yet since then nature has bound me to one whom I loved better than anyone this world ever contained. The trouble then when I lost him was not near so great as is now for there is nothing on earth like ones husband".